With the retail industry averaging open rates of 12.74% and click-through-rates (CTR) of 7.10%, marketers can't afford to undervalue any opportunity to gain their customer's attention. We've talked about transactional emails as a missed marketing opportunity, but here we'll focus on order confirmation emails and why their high open and engagement rates make them so valuable. Order confirmation/receipt emails aren't just important to e-commerce businesses and marketers. In fact, 64% of consumers believe purchase confirmations are the most valuable messages in their email inbox. But we all know actions speak louder than words, so what do consumers do with these valuable emails? Well - in short - they open, engage, and convert from these messages. As you can see, order confirmation emails outperform bulk sent marketing emails across the board in KPIs relating to attention, engagement, and conversion. Now that the value of these confirmation emails is clear, you need to ensure that you're taking full advantage. Acquiring customers is never easy or cheap. In fact, new customers typically cost six to seven times more to acquire versus retaining current customers. Retained customers tend to spend as much as 67% more, and loyal customers can be worth as much as ten times the value of their first purchase. Customers have already shown plenty of interest in your business so don't let them feel ignored or undervalued. Customize your messages as much as possible, for example by segmenting your order confirmations based on product purchases. You can use this information to send receipt emails that include content relating to these products and to cross-sell associated products. Want to see how the world's largest online retailers use their order confirmation emails? Check out our free e-book, Missed Connections. 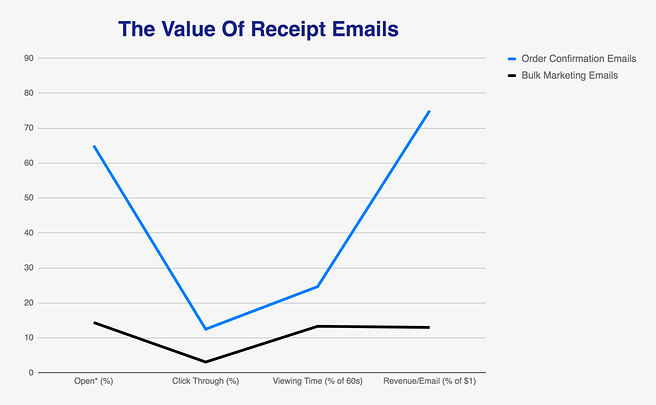 We show you real receipt emails and break down the good, bad, and ugly examples.